Definition at line 59 of file ServiceRep.h. Definition at line 124 of file ServiceRep.h. Definition at line 65 of file ServiceRep.h. Definition at line 34 of file ServiceRep.cc. References NULL, setMaxConnections(), and theIdleConns. Definition at line 50 of file ServiceRep.cc. References Must, SWALLOW_EXCEPTIONS, theIdleConns, theOptions, and theOptionsFetcher. Definition at line 346 of file ServiceRep.cc. Definition at line 352 of file ServiceRep.cc. References Adaptation::Icap::Options::allow206, hasOptions(), Must, and theOptions. Definition at line 533 of file ServiceRep.cc. References Adaptation::ServiceConfig::bypass, Adaptation::Service::cfg(), debugs, status(), up(), and wasAnnouncedUp. Referenced by changeOptions(), and suspend(). Definition at line 200 of file ServiceRep.cc. References Adaptation::Service::cfg(), connOverloadReported, IdleConnList::count(), DBG_IMPORTANT, debugs, max(), Adaptation::ServiceConfig::onOverload, Adaptation::srvForce, theBusyConns, theIdleConns, and theMaxConnections. Referenced by availableForNew(), availableForOld(), and busyCheckpoint(). Definition at line 307 of file ServiceRep.cc. References availableConnections(), Must, theAllWaiters, and up(). Definition at line 317 of file ServiceRep.cc. References availableConnections(), Must, and up(). Referenced by callWhenReady(), and Adaptation::Service::wants(). If there are xactions waiting for the service to be available, notify as many xactions as the available connections slots. Definition at line 248 of file ServiceRep.cc. References availableConnections(), Adaptation::Icap::ServiceRep::Client::callback, debugs, HERE(), i, NULL, ScheduleCallHere, theAllWaiters, and theNotificationWaiters. Referenced by callWhenAvailable(), noteGoneWaiter(), and putConnection(). Definition at line 578 of file ServiceRep.cc. References Adaptation::Initiator::clearAdaptation(), debugs, handleNewOptions(), status(), and theOptionsFetcher. Definition at line 413 of file ServiceRep.cc. References busyCheckpoint(), IdleConnList::count(), debugs, i, Must, NULL, theIdleConns, theNotificationWaiters, and up(). Definition at line 431 of file ServiceRep.cc. 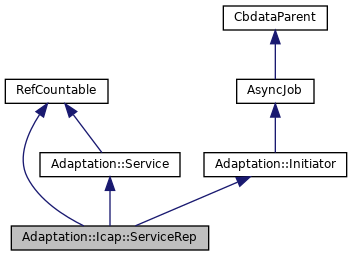 References Adaptation::Service::broken(), Adaptation::Icap::ServiceRep::Client::callback, debugs, HERE(), i, Must, needNewOptions(), notifying, NULL, scheduleNotification(), Adaptation::Icap::ServiceRep::Client::service, CbcPointer< Cbc >::set(), startGettingOptions(), status(), theClients, and theOptionsFetcher. Referenced by announceStatusChange(), availableConnections(), checkOptions(), detach(), Adaptation::Icap::Xaction::dnsLookupDone(), Adaptation::Ecap::ServiceRep::finalize(), finalize(), Adaptation::Icap::Xaction::finalizeLogInfo(), Adaptation::Icap::ModXact::finalizeLogInfo(), Adaptation::Ecap::ServiceRep::handleFinalizeFailure(), Adaptation::Icap::OptXact::makeRequest(), Adaptation::Icap::ModXact::makeRequestHeaders(), Adaptation::Icap::Xaction::openConnection(), Adaptation::Service::Service(), setMaxConnections(), Adaptation::Icap::ModXact::start(), Adaptation::Ecap::ServiceRep::tryConfigureAndStart(), Adaptation::Ecap::XactionRep::updateHistory(), Adaptation::Ecap::XactionRep::updateSources(), Adaptation::Icap::ModXact::validate200Ok(), and Adaptation::Service::wants(). Definition at line 465 of file ServiceRep.cc. References announceStatusChange(), checkOptions(), FadingCounter::clear(), debugs, HERE(), isSuspended, squid_curtime, status(), theLastUpdate, theOptions, and theSessionFailures. Definition at line 480 of file ServiceRep.cc. References String::append(), Adaptation::Service::cfg(), DBG_IMPORTANT, debugs, Adaptation::Icap::Options::error, int, Adaptation::ServiceConfig::method, Adaptation::Icap::Options::methods, Adaptation::methodStr(), NULL, squid_curtime, theOptions, Adaptation::Icap::Options::timestamp(), Adaptation::Icap::Options::ttl(), and Adaptation::Icap::Options::valid(). Referenced by Adaptation::Initiator::announceInitiatorAbort(), callException(), Adaptation::Iterator::handleAdaptationBlock(), Adaptation::Iterator::handleAdaptationError(), Adaptation::Iterator::handleAdaptedHeader(), ClientHttpRequest::handleAdaptedHeader(), Adaptation::Icap::Launcher::noteAdaptationAnswer(), Client::noteAdaptationAnswer(), noteAdaptationAnswer(), ClientHttpRequest::noteAdaptationAnswer(), Adaptation::Icap::Launcher::noteXactAbort(), Adaptation::Iterator::swanSong(), Adaptation::Icap::Launcher::swanSong(), and Adaptation::Initiator::~Initiator(). Definition at line 729 of file ServiceRep.cc. References Adaptation::Service::cfg(), debugs, HERE(), isDetached, and status(). Definition at line 736 of file ServiceRep.cc. Referenced by doneAll(), needNewOptions(), noteTimeToUpdate(), and status(). Definition at line 100 of file ServiceRep.h. References callException(), detach(), detached(), AsyncJob::doneAll(), noteAdaptationAnswer(), noteTimeToNotify(), and noteTimeToUpdate(). Definition at line 224 of file ServiceRep.cc. References IdleConnList::count(), theBusyConns, theIdleConns, and theMaxConnections. Referenced by handleNewOptions(), and putConnection(). Definition at line 97 of file ServiceRep.h. Definition at line 60 of file ServiceRep.cc. References String::caseCmp(), Adaptation::Service::cfg(), FadingCounter::configure(), Adaptation::ServiceConfig::connectionEncryption, Security::PeerOptions::createClientContext(), DBG_IMPORTANT, debugs, DEFAULT_ICAP_PORT, DEFAULT_ICAPS_PORT, YesNoNone::defaultTo(), Security::PeerOptions::encryptTransport, Adaptation::Service::finalize(), getservbyname(), Adaptation::Config::oldest_service_failure, Adaptation::ServiceConfig::port, Adaptation::ServiceConfig::protocol, servent::s_port, Adaptation::ServiceConfig::secure, sslContext, Adaptation::Icap::TheConfig, theSessionFailures, and Adaptation::Service::writeableCfg(). Definition at line 117 of file ServiceRep.cc. References IdleConnList::closeN(), debugs, HERE(), Comm::IsConnOpen(), IdleConnList::pop(), theBusyConns, and theIdleConns. Definition at line 586 of file ServiceRep.cc. References changeOptions(), IdleConnList::closeN(), IdleConnList::count(), debugs, excessConnections(), HERE(), min(), optionsFetchTime(), scheduleNotification(), scheduleUpdate(), setMaxConnections(), status(), and theIdleConns. Referenced by callException(), and noteAdaptationAnswer(). Definition at line 297 of file ServiceRep.cc. References Adaptation::Icap::Options::fresh(), theOptions, and Adaptation::Icap::Options::valid(). Referenced by allows204(), allows206(), up(), wantsPreview(), and wantsUrl(). Referenced by Adaptation::Icap::Launcher::launchXaction(), Client::startAdaptation(), ClientHttpRequest::startAdaptation(), startGettingOptions(), Adaptation::Iterator::step(), and Adaptation::Initiator::~Initiator(). Referenced by Adaptation::Icap::Launcher::launchXaction(), noteAdaptationAnswer(), Client::startAdaptation(), ClientHttpRequest::startAdaptation(), Adaptation::Iterator::step(), and Adaptation::Iterator::swanSong(). Definition at line 682 of file ServiceRep.cc. Definition at line 460 of file ServiceRep.cc. Reimplemented in ClientHttpRequest, and Client. Definition at line 17 of file Initiator.cc. Definition at line 548 of file ServiceRep.cc. References Adaptation::Answer::akError, Adaptation::Answer::akForward, Adaptation::Initiator::clearAdaptation(), Adaptation::Icap::Options::configure(), DBG_IMPORTANT, debugs, RefCount< C >::getRaw(), handleNewOptions(), HERE(), Adaptation::Initiator::initiated(), Adaptation::Answer::kind, Adaptation::Answer::message, Must, NULL, status(), and theOptionsFetcher. Definition at line 179 of file ServiceRep.cc. References debugs, HERE(), and theBusyConns. Referenced by Adaptation::Icap::Xaction::dieOnConnectionFailure(), Adaptation::Icap::Xaction::handleSecuredPeer(), and Adaptation::Icap::Xaction::swanSong(). Definition at line 173 of file ServiceRep.cc. References Comm::Connection::fd, fd_table, Comm::IsConnOpen(), and Must. Referenced by Adaptation::Icap::Xaction::handleSecuredPeer(), and Adaptation::Icap::Xaction::noteCommConnected(). Definition at line 95 of file ServiceRep.cc. References FadingCounter::count(), debugs, HERE(), isSuspended, Adaptation::Config::oldest_service_failure, Adaptation::Config::service_failure_limit, status(), suspend(), Adaptation::Icap::TheConfig, and theSessionFailures. Referenced by Adaptation::Icap::ModXact::bypassFailure(), and Adaptation::Icap::Xaction::callException(). Definition at line 239 of file ServiceRep.cc. Definition at line 95 of file ServiceRep.h. Definition at line 392 of file ServiceRep.cc. References Adaptation::Icap::ServiceRep::Client::callback, debugs, HERE(), i, Must, notifying, NULL, ScheduleCallHere, status(), and theClients. Referenced by doneAll(), noteTimeToUpdate(), and scheduleNotification(). Definition at line 368 of file ServiceRep.cc. References data, debugs, detached(), HERE(), Must, noteTimeToNotify(), CbcPointer< Cbc >::set(), startGettingOptions(), status(), theOptionsFetcher, and updateScheduled. Referenced by doneAll(), and ServiceRep_noteTimeToUpdate(). Definition at line 658 of file ServiceRep.cc. References debugs, Adaptation::Icap::Options::expire(), HERE(), Adaptation::Config::service_revival_delay, squid_curtime, Adaptation::Icap::TheConfig, theOptions, and Adaptation::Icap::Options::valid(). Definition at line 292 of file ServiceRep.cc. Definition at line 147 of file ServiceRep.cc. References busyCheckpoint(), Comm::Connection::close(), comm_reset_close(), commUnsetConnTimeout(), debugs, excessConnections(), HERE(), Comm::IsConnOpen(), Must, IdleConnList::push(), theBusyConns, and theIdleConns. Definition at line 454 of file ServiceRep.cc. References CallJobHere, debugs, HERE(), noteTimeToNotify(), and theClients. Referenced by callWhenReady(), and handleNewOptions(). Definition at line 620 of file ServiceRep.cc. References DBG_IMPORTANT, debugs, eventAdd(), eventDelete(), eventFind(), HERE(), ServiceRep_noteTimeToUpdate(), squid_curtime, theLastUpdate, and updateScheduled. Referenced by handleNewOptions(), and suspend(). Definition at line 185 of file ServiceRep.cc. References Adaptation::Service::cfg(), Adaptation::Icap::Options::max_connections, Adaptation::ServiceConfig::maxConn, theMaxConnections, and theOptions. Referenced by handleNewOptions(), and ServiceRep(). Definition at line 608 of file ServiceRep.cc. References debugs, HERE(), Adaptation::Initiator::initiateAdaptation(), Must, status(), and theOptionsFetcher. Referenced by callWhenReady(), and noteTimeToUpdate(). Definition at line 689 of file ServiceRep.cc. References MemBuf::append(), Packable::appendf(), buf, MemBuf::content(), detached(), Adaptation::Icap::Options::fresh(), isSuspended, notifying, FadingCounter::remembered(), MemBuf::reset(), CbcPointer< Cbc >::set(), MemBuf::terminate(), theOptions, theOptionsFetcher, theSessionFailures, up(), and Adaptation::Icap::Options::valid(). Referenced by announceStatusChange(), callException(), callWhenReady(), changeOptions(), detach(), handleNewOptions(), noteAdaptationAnswer(), noteFailure(), noteTimeToNotify(), noteTimeToUpdate(), and startGettingOptions(). Definition at line 280 of file ServiceRep.cc. References announceStatusChange(), DBG_IMPORTANT, debugs, HERE(), isSuspended, scheduleUpdate(), Adaptation::Config::service_revival_delay, squid_curtime, and Adaptation::Icap::TheConfig. Definition at line 302 of file ServiceRep.cc. Referenced by announceStatusChange(), availableForNew(), availableForOld(), callWhenAvailable(), needNewOptions(), and status(). Definition at line 331 of file ServiceRep.cc. References hasOptions(), Must, Adaptation::Icap::Options::preview, theOptions, Adaptation::Icap::Options::transferKind(), and Adaptation::Icap::Options::xferPreview. Definition at line 325 of file ServiceRep.cc. References hasOptions(), Must, theOptions, Adaptation::Icap::Options::transferKind(), and Adaptation::Icap::Options::xferIgnore. Referenced by Adaptation::Ecap::ServiceRep::finalize(), and finalize(). Definition at line 141 of file ServiceRep.h. Definition at line 188 of file ServiceRep.h. Definition at line 145 of file ServiceRep.h. Referenced by changeOptions(), noteFailure(), status(), suspend(), and up(). Definition at line 147 of file ServiceRep.h. Referenced by callWhenReady(), noteTimeToNotify(), and status(). Definition at line 113 of file ServiceRep.h. Definition at line 114 of file ServiceRep.h. Definition at line 138 of file ServiceRep.h. Referenced by availableForNew(), busyCheckpoint(), existWaiters(), noteGoneWaiter(), and noteNewWaiter(). Definition at line 135 of file ServiceRep.h. Referenced by availableConnections(), excessConnections(), getConnection(), noteConnectionFailed(), and putConnection(). Definition at line 126 of file ServiceRep.h. Referenced by callWhenReady(), noteTimeToNotify(), and scheduleNotification(). Definition at line 142 of file ServiceRep.h. Referenced by availableConnections(), callWhenAvailable(), excessConnections(), getConnection(), handleNewOptions(), putConnection(), ServiceRep(), and ~ServiceRep(). Definition at line 130 of file ServiceRep.h. Referenced by changeOptions(), probed(), and scheduleUpdate(). Definition at line 139 of file ServiceRep.h. 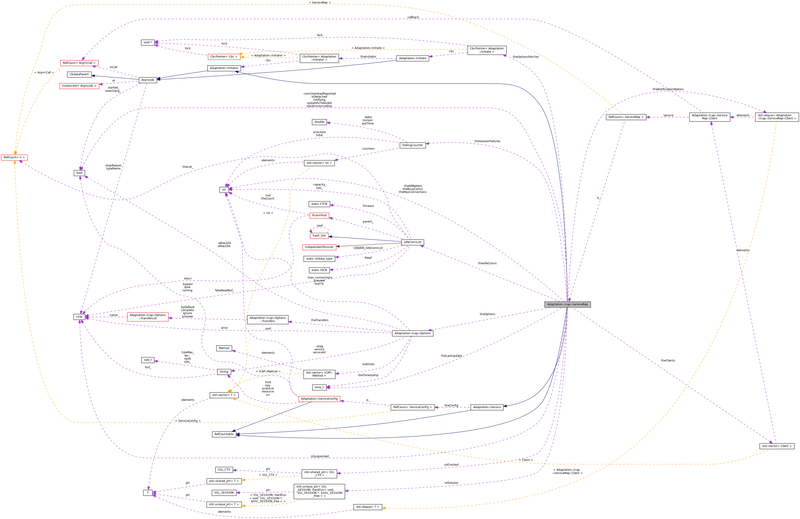 Referenced by availableConnections(), excessConnections(), and setMaxConnections(). Definition at line 134 of file ServiceRep.h. Referenced by busyCheckpoint(), and callWhenAvailable(). Definition at line 128 of file ServiceRep.h. Referenced by allows206(), changeOptions(), checkOptions(), hasOptions(), optionsFetchTime(), setMaxConnections(), status(), wantsPreview(), wantsUrl(), and ~ServiceRep(). Definition at line 129 of file ServiceRep.h. Referenced by callException(), callWhenReady(), noteAdaptationAnswer(), noteTimeToUpdate(), startGettingOptions(), status(), and ~ServiceRep(). Definition at line 144 of file ServiceRep.h. Referenced by changeOptions(), finalize(), noteFailure(), and status(). Definition at line 148 of file ServiceRep.h. Referenced by noteTimeToUpdate(), and scheduleUpdate(). Definition at line 187 of file ServiceRep.h.